This website is an effort to bridge the gap between mystical knowledge and scientific exploration of ‘existence’ or ‘reality’. This new ontology (ontos= authentic essence of being) revolves around a supposedly ancient, but simple mathematical natural number (1, 2, 3, 4, 5, … etc.) theorem, applied to the geometry of circles and squares, with evidence and clarification given in many chapters. This ontology is based on the assumption that mathematics underlies the manifestation of Nature, a modern version of Pythagoras’ ‘All is Number’, as resonances in vibration. I’ve called this theorem by many names, ‘Geometry of Square Root Two’, ‘Pyramid Proportion’, ‘Maeshowe Theorem’ and ‘Rainbow Proportion’, reflecting its intriguing contents and versatility, but the ‘ Lost Menkaure and Maeshowe Theorem’ is an appropriate historical name, I think, because the theorem went lost for over 4000 years, although its quintessence still stands in ancient buildings to this day. 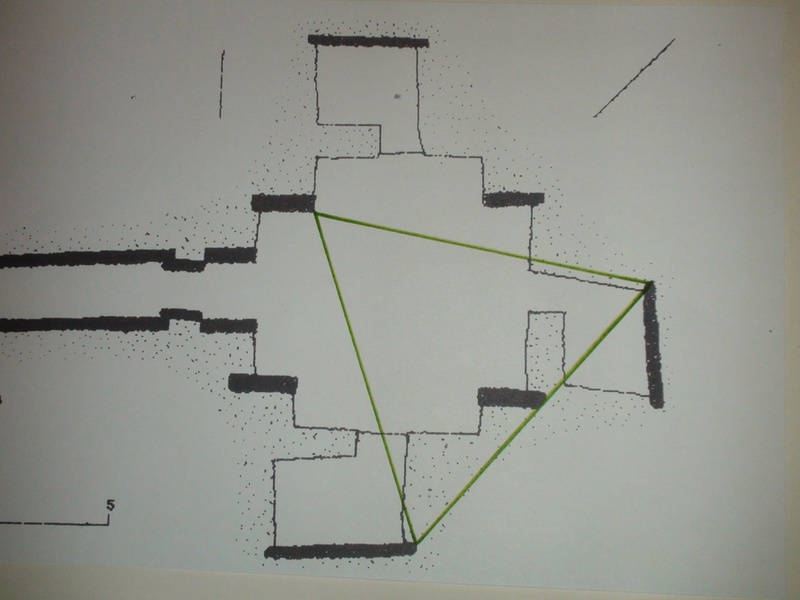 The crucial ratios of the theorem have been solidly recorded in buildings of at least two ancient ‘megalithic’ (big stone) cultures, that is in well-known Giza in Egypt and in Orkney, an archipelago off the northern coast of Scotland. For Orkney it means going back into the late Stone Age some 5000 years ago, 3000 BCE, to Maeshowe and its first European squared space, for Egypt it means going back to Pharao Sneferu’s Meydum pyramid with ratios 275 : 175 (11:7) in Royal Cubits (RC) for base length and height, preceding, but like the Great Pyramid = 440RC : 280RC = 11 : 7 and the Third Pyramid Menkaure at eastern platform level = 198RC : 126RC = also 11 : 7. Meydum was the first ‘true’ pyramid, after having been started like Imhotep’s step-pyramid-type (Saqqara) and its design in ratios is mathematically similar to the Great & Third Pyramids at Giza, but earlier, so this means going back to at least some 4600 years ago, 2600BCE, to Pharao Sneferu at the end of his long reign. The two totally different, but ‘megalihic’ cultures may have been partly contemporaneous. Both the Atlantic and the Mediterranean ‘Megalithicum’ ‘eternalized’ their scientific/cosmological knowledge in megalithic buildings and both erected huge standing stones to exalt the sun and the cosmos (my definition of a ‘Megalithicum’); some standing stones also functioned as sun dials (Obelisks – Egypt, Grand menhir-brise – Brittany, France). It is an early manifestation of the awareness of rhythm and cycles in Nature and the Cosmos, of scientific interest. The Lost Theorem can be seen as on a par with or even complementary to Pythagoras’ famous ‘right angled triangle and squares-theorem’ (a² + b² = c²), of which the ratios appear in Giza in the Second Pyramid (3²: 4²: 5²) Khafre, though long before Pythagoras’ time. 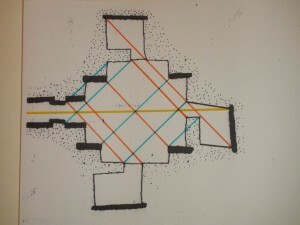 The ‘Lost Theorem’ itself also happens to be a ‘square-theorem’ as we see it in the Great & Third Pyramid and in Maeshowe’s chamber (Orkney), but this lost theorem contains the relation of squares and circles (and eventually of torus and sphere), so you bet a more intricate one, and indeed it is different, very different; so different with its seemingly imprecise and ‘hidden’ rules, that it got lost and the lesser but apparently more precise Pythagoras-theorem (3²: 4²: 5² -> 9+16=25) became a preferred design with later pyramid-builders and survived to this day as one of the cornerstones of Euclidean geometry. What the Lost Theorem does is expressing ad infinitum the ratios of ‘squares in circles in squares in circles….’ (inscribing, encompassing) in natural numbers as we see it in the picture, that is, in a specific set of fixed unchanging integer ratios, like 11:7 and 11:14 and 10:9 and 162:100, which are the quintessential ones. (To remind you: in standard maths this is only achieved through the irrational transcendental number Pi, π, which though blocks any smooth relation between natural numbers in circles and squares, and also through the irrational golden mean number 1.618… =Phi, which is here 1.620). The eventual order is achieved in the Lost Theorem by using a ‘rational’ approximation of π as a squareroot2 number= 20/9xV2 or 3.142696… (ratio circle circumference and its Euclidean diameter, 3.14 159…) and by a rational value for π²-squared ( 9.8…), respectively by the rational numbers: 22/7 (3.14 2857 1428…) (also 2800/891= 3.1425 36…) and 800/81 (9.87654321.= 22/7 x 2800/891), all expressed in natural and rational numbers. 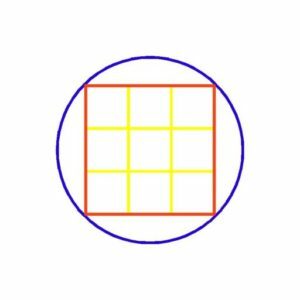 The theorem’s true significance though lies in ‘squaring the circle by circumference’ (this is different from the famous and notorious ‘area-squaring of the circle’), which we see here (picture above) realized in the yellow square perimeter being equal to the red circle circumference. The big blue circle diameter is 10, the red circle diameter is 9, as ratios. 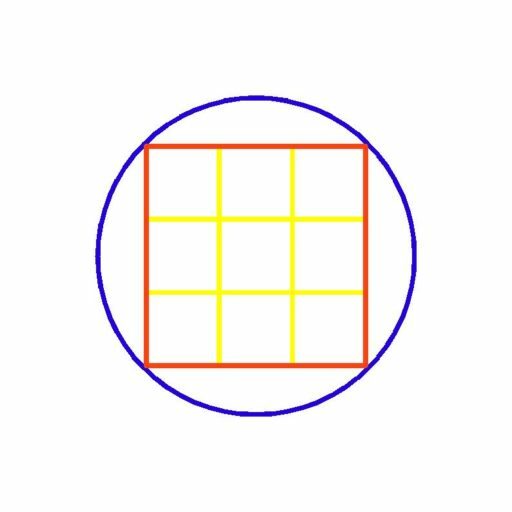 The big blue circle perimeter 40, the yellow square perimeter is 36, which is again ratio 10 : 9. 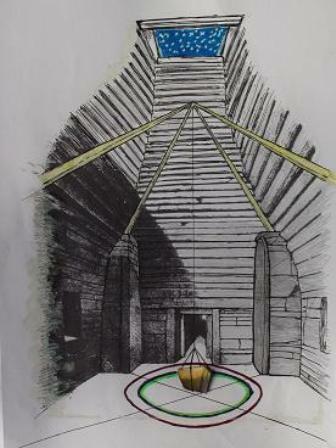 In Orkney though the theorem, in a peculiarly extended but more rudimentary form (8: 9: 10), lies hidden in the lay-out of Maeshowe’s megalithic chamber and comes into the open in the dimensions of the several man-made circles of the nearby Ring of Brodgar ( its standing stone circle and rock-hewn moat with 2 sloping edges give 3 ratios), there though expressed in the big numbers of Giza (99 or 198 and 140 or 280). This is the full natural-number-solution for the ‘rationalisation of number-irrationality’, i.c. 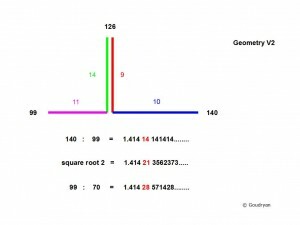 of ‘square root 2’ now as 140/99 and 99/70. (see Rationalizing the Ir-rational). See 99 is a rep-digit (repetitive digit) of rep-unit 11 times 9. My only other defence for this rather ‘incredible’ but nevertheless striking situation must be that this mathematical model I found(ed) and use has connected many ‘incredible’ things in the course of my exploration, events that I personally experienced as great gifts not only because they were completely unexpected and enhance the beauty and profundity of the model, but also because their enigmatic occurrences in my personal life keep me highly motivated to pursue this long quest into the deep past; there is a treasure to be found at the end of the (double?) rainbow, as you know. 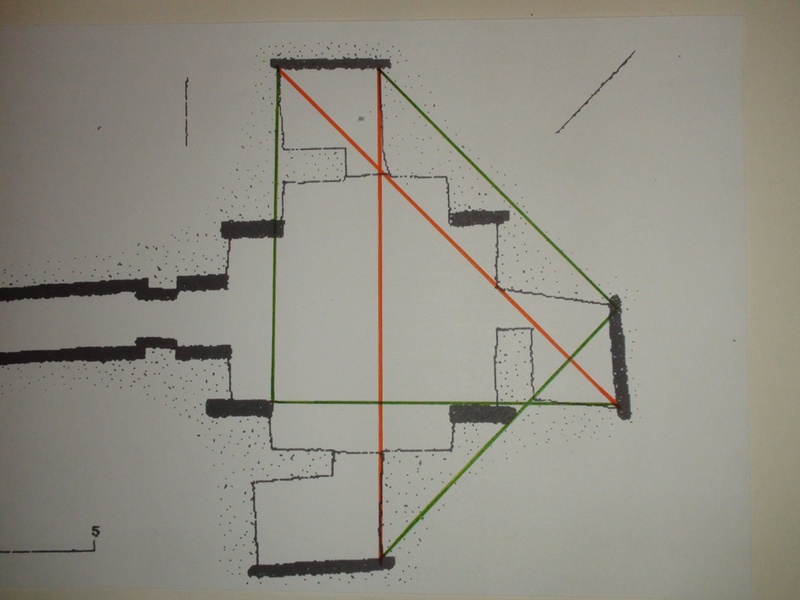 My earlier mentioned fixed measure of 0.5236m as I came to use it for Giza’s Royal Cubit (RC), elsewhere usually given as .524m, is a gift in still another way, because as Megalithic Ell it not only fitted Orkney better than it does Giza, but it turned out to be exactly 1/6 of Pi (6x.5236=3.1416) and 1/5 of Phi^2 (5 x .5236=2.618) as I only realized during my Orkney-calculations. This means that a (stone-) circle diameter measured in metres gives multiplied by 6 the number of megalithic ells (ME or RC) in the circumference (6ME/1m = Pi ); a very handy gift this one because it may give a first indication of the possible number of stones in the original circle, the more so because also the yard and remen are at hand as measures. To make things worse for the sceptics I show that the diameter of the stone circle of Orkney’s Brodgar is equal to the side of the Third Pyramid at platform level, and equal to the distance from the King’s Chamber floor level to the top of the Great Pyramid, both 198RC (103.67m); and that the Brodgar ring’s circumference is equal to the ground-diagonal of the Great Pyramid (880 Remen= 325.82m or 396 Megalithic Yard (4×99). Moreover it shows the intrinsic relation between the Great and Third Pyramid in Giza (20:9), all this insight in relations thanks to the, possibly contemporary, measures of Brodgar and Maeshowe! 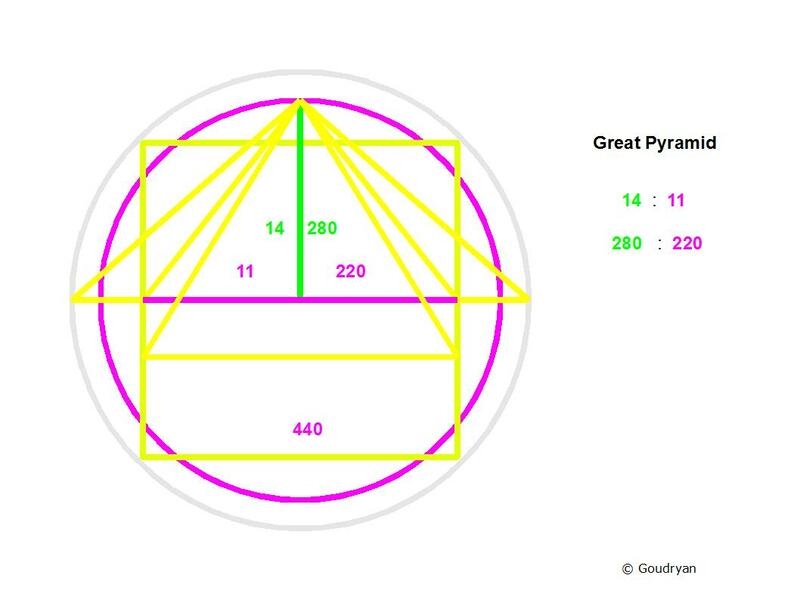 My important finding that the Third Pyramid must hold the mathematical key and theoretical blueprint to the Great Pyramid and relates in volume virtually as 1 : 11, comes straight from the analysis of the Orkney ratios! This is of course all a bit too much to believe in for most people and certainly for the professional archaeologist who will dismiss it as ‘lunatic fringe’ science, but, reader, I had the same problem, I was not out to get these things at all and at first not even really happy when I found it, for this very reason (this is ‘too much’), but I’ve checked it all many times and I am not in the habit of fooling myself, nor others; it’s in the data and especially in the ratios. (I compare with Lehner, Cole and Petrie data). In case of differences they are all too close to call, or just ‘controversial’ in this Megalithic-context, with differences expressed in centimetres over lengths of hundreds of metres. (Lehner’s data for Gr.P.-sides are all 230.33m – possibly a misprint- Cole’s average = 230.36m). The inevitable bickering about the correct length does a lot of damage to a serious approach to the logic of the designs, because it is about (number-) logic integrated in design, it is about the intention of the design, not about perfect execution, it’s about the genuine probability of a deep insight and a great Cosmic Idea, ‘Earth as a sphere’ for one thing, it is not about cynical 20th century scientific scepticism. It’s about possible synchronism and recurring serendipity; and about a near mystical (historical) Enigma: how two so widely differing cultures could come up with the same mathematics, the same units of measurement and the same ‘cosmic length’ at about the same time. Near Maeshowe, at the now famous Ness of Brodgar site, situated between the (huge) Stones of Stenness (ever 11 or 12 standing and with less than a third left standing some near 6 m high, it still holds some of its original echo in its centre, manmade! ), itself one of the earliest stone circles and henges, if not the first (having virtually the same outside measure as Stonehenge, mind you! ), these Stones of Stenness on one side and the huge Ring of Brodgar (ever 60 or more stones) on the other, there is clear evidence of paint-making at the Ness, paint which could have been used to mark the stones of the two nearby Rings with different colours for counting and recording different cosmological time cycles. Here the standing stone circle becomes a record holder, a calculator and a geometrical playground, like connecting certain stones with ropes, making a square with the four cardinal points, like in Maeshowe, knowing the diameter as 198ME and consequently the side of the square is 140 ME = 73.30m; so possibly it was an educational place, in all it was so much more scientific/cosmological than rigidly ritual in practice. Not only the amount of stones holds numbers, these are also in the dimensions of the works, where the ratios get geometrical and arithmetical meaning. I have argued that the two standing stone circles with drumbeat together with a huge pendulum in Maeshowe (see picture), were instrumental in creating day-time, clock-time, at the equinoxes. This is what the Ness of Brodgar and its environs were possibly about and probably famous for: the ‘Creation of Time’, a spiritual cosmological centre with people flocking here as ‘Pilgrims of Time’ from far and wide, to hear the heartbeat of the universe in the drums that kept the rhythm through day and night at the equinoxes and to compare it with their own heartbeat and take that home as a measure of time, but also to see the many rainbows and marvels of the Northern lights, to hear the echo of their voices at the centre of Stenness, as in caves, to being at the end of the ancient world, beyond the North Winds (Hyperborea). My explanation for the mysterious mathematical relation between Giza and Orkney has moved from Egyptian naval expeditions visiting the ‘fabled’ archipelago (Hyperborea, Atlantis) with on board the great architect and healer Imhotep in his youth, who then later built the Saqqara pyramid, to ‘morphic resonance’, same (evolutionary) things occurring in unconnected places at the same time (Sheldrake), onto the shamanic ‘Supernatural’, of which I now think the last one is the most probable, but morphic resonance is a close second. 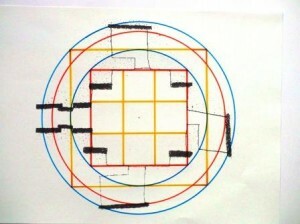 As shamans claim they derive their knowledge about use of medicinal plants in trance from the (spirits of) the plants themselves and they climb the Rainbow, I have considered that a geometrical form of their beloved Rainbow might have revealed its numerical/rational/pictorial make-up to the shaman in a similar way. (shaman Joska Soos’ paintings are highly geometrical, as are some of his contentions, see ‘Shaman and standing stone’). Since it is very well possible that Giza and Orkney were, at least partly, contemporary, a synchronic shamanistic and supernatural revelation in both cultures must be reckoned within the possibilities, it could be that the Megalithic Ell, as well as the equivalent Royal Cubit, do indeed represent the ideal ‘cosmic unit of length’, each occurring in some local revelation and showing again ‘man as the measure of all things’ as we see it in palms, feet, thumb and finger measures and that indeed this sacred length was found by or revealed to both scientific Megalithic cultures as they appear to use the same number-logic as well and came to the same ‘crucial length’ of 198 Megalithic Ell or Royal Cubit (198=2x99) = 103.67m. It’s all about the ratios of 11:7 and 10:9 and their ‘interactions’. 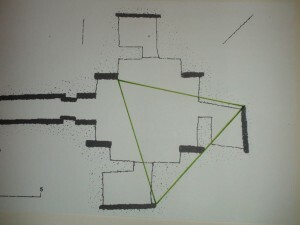 We see this length returning in the diameter of Brodgar’s Ring and in that of one of the inner circles of Avebury’s lunar clockwork (chapter), even the (irregular) stone circle of Newgrange (103.6) is thus reported, but, more importantly, this length is also equal to the square base length of the 3rd Pyramid at platform level, 198RC. Lehner’s data suggest 196RC = 102.63m (L=102.2) and 200RC = 104.7m (L=104.6) but this makes no difference for the relevant value of the diagonal. (I think a satellite and computer imaging should do these jobs by now). I stick to the size 198RC because it also appears as the distance of the floor level of the King’s Chamber to the top of the Great Pyramid, 198RC (280-82). 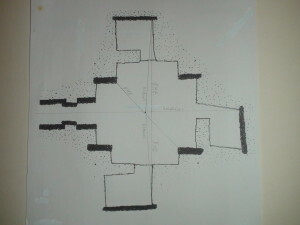 Intriguingly it is also the pyramid side lengths at the exit levels of the air-shafts (see picture John Legon), so that the top 1/11th volume of the Great Pyramid upwards from shaft-level is 126RC (280-154, Legon) high and consequently identical with the Third Pyramid at platform level. This is the reason for the angles of the shafts, they had to mark out on the outside the theoretical mathematical principle topping the building as its ‘mathematical brain’, a visible horizontal mark and a practical airshaft at the same time (there were most probably people in this building going about their business whatever it was, see gallery, no one was ever buried there), so a visibly marked top with ten times its own volume beneath it. The number 11 (22/7) is the number of the Great Pyramid (440), 37 (3×37=111) of the Second Pyramid (100+37; 3 x 137= 411) , 9 and 10 and 9 and 14 of the Third Pyramid. 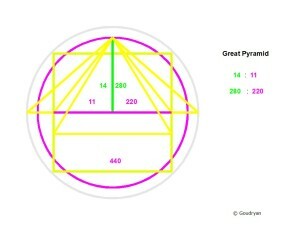 The height of the Great Pyramid is equal to the diagonal of the Third’s ground floor at platform level =√(198²)x2 = 280. These differences are very small here but can be decisive in our argument when it comes to an overall picture, the accumulation of arguments within the same framework. It is only because they had so great reverence for the building technique and genius of their ancestors (Sneferu) that even the Menkaure pyramid, the key to the mathematics, was built, where it is so much less impressive than the others, close to being an anomaly. It may even be that the foundations of all three pyramids were laid at the same time still by Sneferu or soon after. Obviously its authentic value and scaled(!) design was seen as crucial to the cosmological (scientific) message of the whole site. This is what I read in it. When the temple is harmonious, the universe is in harmony. The shamanic connection, has become fundamental in my understanding of the Stone Age spirit, time and again I emphasize how much I try to appreciate the world-view of shamanism as it emerges the world over in the Stone Age and with this fascination the Tibetan Buddhist connection comes to the fore. I am aware that shamanism is a sensitive topic in Tibetan Buddhist circles, because it would be seen by the outside world as not genuinely Buddhist. During the recent Kalachakra in Ladakh (’14), which I attended, the Dalai Lama mentioned explicitly this perception by critics of Tibetan Buddhism, possibly within Buddhism, that Lamaism and shamanism are not true Buddhism. But what is true Buddhism? Buddhism always takes the flavour of the culture where is flourishes, like Ch’an (Zen) in China, Nichiren and Zen in Japan and Vajrayana and Tantrism in the Himalayas. The early Buddhist monks were compelled to show the Tibetan population that their Buddhist teaching could produce the same magical powers as the shaman possessed in order to convert them and gain their support. I consider the shamanic flavour of Tibetan Buddhism as one of its great attractions, which does not at all interfere with the sincerity of the Tibetan commitment to the real great Mahayana ideals of compassion and universal liberation. On the contrary Tibetan Buddhism seems designed to heal the soul and who else than the Buddha was also called the Great Physician, the Great Healer (bhisakko), the supreme surgeon ( sallakatto anuttaro) and in that respect many Tibetan Lamas are outstanding healers. How could there be anything ’embarrassing’ about being the heirs of spiritual traditions and techniques that go back to the unfathomable depths of the Stone Age and to the first great awakenings of the ‘human’ mind in that age; after all, several Buddhas are supposed to have preceded our historical Buddha and they don’t come by every few centuries, it seems. Besides that the original Tibetan shamanic Bon-religion has now effortlessly been incorporated in the Tibetan Buddhist brotherhood, so it is all very close, but not decisive. To me the Tibetan Buddhist and shamanistic parallels as: chosen-ones, rain-making, oracles, divination, drumming, fast travelling, form the living bridge to a ‘spiritual atmosphere’ and wisdom of the Stone Age. These techniques though are peripheral in the central teachings. The logical, dialectical and magical mindedness of the Tibetans reflect the historical situation of the tradition. It is not well-known that Tibet in its Buddhist florescence for centuries culturally dominated the whole of Central Asia to deep in Siberia. The similarity with Mongolian Buddhism is evident and that the latter also share in a shamanic tradition cannot be doubted whatsoever. What fascinates me in shamanism is the extra-ordinary (suggestive) powers of the human mind, because those must in origin have been universal, as shamanism was and those powers are still be available to us all, in principle, I think (I know). Tibetan Buddhism is possibly the only highly organized tradition which has preserved and still practices these age-old techniques, most of which are beyond scientific comprehension (at the moment) and rock the foundations of the Western rational world view; “this is not possible”, we say. This same Tibetan Buddhism is now also closest to modern scientific approaches of reality (Kalachakra) as we will see shortly, which again shows the extraordinary sharp intuitive insights it is based upon. Shamanism has been the spiritual development and exploration of the human mind through the Stone Age the world over in different places with different techniques but always with extra-ordinary healing mind-powers as a result. The first development of language must be thought of as within the shamanic horizon. Those who study root-languages like Proto Indo-European (PIE) know all too well how much insight and intelligence went into the formation, derivation and meaning of words, and there were sounds only, no symbolic frame work. Here again we see unfathomable wisdom and capability in the deep past. As I have argued elsewhere: the very fact that shamans could risk their lives for the benefit of others places them on a spiritual level that is beyond any religion and at the same time expresses the highest form of spiritual attainment, that is: self-sacrifice for the right cause ( Jezus, Socrates, Buddha-teaching). Shamanism is in this view pre-religious and pre-philosophical enlightenment expressing a rich and integrated spiritual life in which the whole world is ‘spirited’ and open to contact, even communication. What I have stated so far is only the historical and cultural context in which I place the mathematical theorem that I found independently of these rather ‘solid historical records’. First it was ‘Giza’ that surprisingly fitted my model, then a few years later ‘Orkney’, both these places were just other incredible ‘gifts’ to sustain my ‘improbable’ findings in ‘natural number geometry’ and some pertinent claims in other fields, but whatever their status as scientific confirmation (at least in History), these (pre-) historical places have no bearing on the mathematical validity and importance of this model, as such. The model stands on its own. Try to grasp it, it is amazingly ‘solid and aesthetic’. At first sight the complementary natural number theorem I have ‘uncovered’ (it has always been there of course), looks like a Kindergarten mathematics and you certainly could make a nice puzzle for very young children on the basics of it and making them acquainted with numbers and geometry in one go, it is very pictorial as well, but when you get to the amazing intricacies of it, it can become dizzying, however simple the ingredients remain, because only the numbers 1-14 are involved. I am not a mathematician and I can only do very simple things, so most people with education can follow this exposition and enjoy math maybe for the first time and it also maybe the reason why I have done what no mathematician would obviously ever do, that is changing the rules of mathematics by holding the integrity of the natural numbers ‘sacred’ and follow where they lead. The new rules are: only natural or rational numbers, complementarity, transparency, approximation, resonance in ratios. So irrational numbers, like sqrt2, or transcendental numbers, like Pi, are off limits. 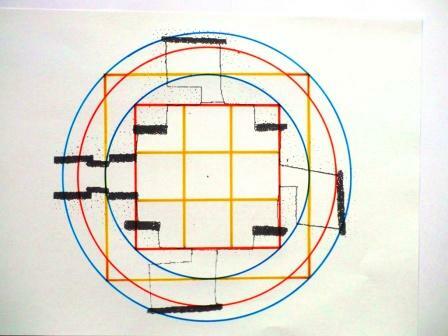 Now one could argue that this is just a nice set of rules to make exquisite designs with squares and circles involving the golden rule, so an aesthetic device, but I claim not only that it was discovered already thousands of years ago, but also that it concerns the basic mathematical rules that govern Nature as such. That is, in all its simplicity: a profound scientific device. Given the fact that it chimes very well with the new drive for a fundamental paradigm-shift in Science, which places Mind at the centre of reality, I hope my work can contribute to strengthen this movement (Laszlo e.a.) towards a spiritual foundation of science and philosophy. Initially this peculiar geometry evolved from a ‘decimal nine-number system’ (for lack of a better expression), inspired by cuneiform clay tablets from ancient Sumer (Iraq) I saw in a newspaper (’98) and worked out. This 9-number system, Sumerian or not, is a rational number system and still at the heart of all the calculations here, as it is the ratio 10:9, which produces the rational numbers (10/9 =1.11111…. to 9.99999….=10, then: 11.11111… etc., so 9 rational numbers in the space of 10 natural numbers) and it is perfectly tailored for the calculations of the derived geometry; they cannot be separated. What makes this ‘natural number-logic’ such a sure and fast calculator is that it is self-correcting and self-contained and based on natural and rational numbers only. As soon as unsuitable input is involved the logic of the numbers crashes, moreover the system is such that the answer is already at hand and could in principle be immediate. Here we may see how ‘immediacy’ in physics actually functions, it’s a mathematical necessity, outside of time (another proof time does not exist), and, given certain specifics, the answer is logically inevitable and through timelessness becomes ‘immediate’, and easily ‘non-local’ (space-less, without distance). ‘Immediacy’ functions ‘non-local’ through the Zero-dimension, I claim, the inner border-point of space, without locality, as I will describe below. This is about a magic number, a BIG number, in short, and my system seems to show ‘how HE pushed his pencil’. I can present it in different formulas which each may show the deep-structure of the number (and without secretly putting it in anywhere). R3, 111, a major repunit, is involved and our central ratio 10:9 (1.11111…….) ‘squared’ (1.234567…) is involved but the number also can be read very plainly as 3700/27 = 137.0370370370… , though scientifically defined as 137.03597….. , a difference of 0.0010…., one -thousandth) The numbers 37 and 27 have a peculiar relation in 27 x 37= 999 → 999/9= 111 (R3), the numbers 3 and 37 in R3 are firmly related to one- third of the repunits in 3 x 37 = 111. We can also produce the Feynman coupling value of 0.08542455… as the square root of 27/3700 = 0.08542421…, with difference of 0.00000034…., that is less than 1-millionth. Not bad (and rather better than in the ‘alpha’ version of a thousandth!). So we see that the shape of this ‘Holy Grail number of Physics’ is rather trivial in the rational numbers 3700/27 or the square root of 27/3700, whichever way you like (the number is apparently known in different shapes). You won’t believe me now, but time will tell. You may think the prime 37 is random, but the repunits (111….111) show it isn’t: 3 x 37 = 111 (R3). Repunits are the key to the calculator and the fundamental wave-patterns as they reflect so closely the 10/9= 1.111111111….. relationship. Then there is the number 27 = 3 x 3 x 3, a basic cube of the pivotal prime 3. The number 27 appears also prominently in packing theory with circles in hexagons (Kepler density quotient pi/V18= 0.74048222… in my theoretical system is 20/27= 0.740740…). Possibly this is a key to the enigmatic hexagon at the pole of Saturn! This is no longer ‘recreational mathematics’, which ‘repunits’ are deemed to be in professional circles, this is the ‘real stuff’, however hidden and enigmatic it still may appear now. It is the powers of 10 in relation to 9, with only one unit difference; formula repunit, only one spark changes the structure of numbers. In the powers of 10 the extra-primes 2 and 5 are stored, plus or minus 1 produce a sum of totally different primes, either 111….111 or 100….001 and multiplicated they form a new repunit. I have given here two examples of the stunning approximations I can make with this number system and with immediate numerical transparency. But my exploration of the number system brought a large variety of natural constants to light. As my personal contribution to clarifying this ‘pre-historic mathematics’ I regard the insights that the system’s logic describes a basic 10:9 resonance, which appears between spherical and toroidal aether waves at all levels, as I understand it; that this resonance is found in the Solar System data and visible in the rings of Saturn, that as other example there exists a steady 11:14 (double) Rainbow Proportion resonance and that the 2-D circle and square natural number ratios can stand for sphere and torus (ball and ring) geometries in space and for the necessary interaction of their wave-systems in natural number resonances. Resonance is always a whole number phenomenon, keep that in mind, this is also the ultimate scientific ‘rationale’ for this peculiar mathematical model I developed and employ. This last insight then is seen as the fundamental geometry of space down to the Planck-length. The mathematical model in my view could describe the resonances of the deep field vibration of physical reality, analogue to super-strings. Nevertheless it is simpler and more straightforward than super-strings (no ontological questions: what is a string made of?) and it works on all scales, be it not with 11 dimensions but only 5 or 6, depending on what is included and how you count. (is the zero dimension a dimension?). Here we see what the Theorem does: it connects seemingly completely unrelated phenomena by shedding unexpected light on certain relationships, always touching on the deepest levels of reality. It’s like a magic wand sometimes. The dimensionless universal constants, for example, have no place in any existing scientific physical theory, but they find a natural translation in this model and that is a feat of great scientific importance when right, I would say, as it shows that something fundamental is missing in gravity theory regarding resonance. Since I have never stopped thinking about the implications of these fundamental integer ratios I have naturally come to a rather complete frame for ontology and cosmology. I am aware this is pretentious, but I had no choice, it grew as of its own logic. Besides that it was supposed to be a theory of everything (TOE), that was the challenge in those days, maybe still is, but I still wish to formulate something, find a language, that is a real bridge from science to the mystical experience and the Mind and I hope it is consistent and universal and that what I do with my very limited knowledge is set the first feeble Kindergarten steps in the revelation of its entire scientific and mystical scope, which might be epochal. Reality is an important concept in philosophy and hard to define but it could be said to be that which we experience as ‘the world’ (which is ambiguous in itself, but you know what I mean, by context). What we perceive as ‘reality’ though, cannot be severed from our faculties. We perceive a world as it presents itself within the scope of our senses and capacities. Our, limited, senses ‘create’ the world as we ‘experience’ it. This insight is in the West usually attributed to the philosopher Kant, heralding the European ‘Enlightenment’ epoch, but it was an analysis the Buddha (and others) had made already over 2000 years earlier. Today the influence of the mind on reality is dramatically shown in quantum-physics where scientists have lost their grip on their concepts, creating ‘contradictios in terminis’ and other logical monstrosities, like: ‘vacuum-energy’, ‘wave-particle duality’, ‘probability wave’ and, of course, the ‘BigBang’….., that even spiritual people feel forced to believe in (such is the force of a paradigm). That there is a ‘dependent origination’ of reality is another of the Buddha’s insights which scientists now have to grapple with. The link to Buddhism is in my work most ‘material’ in the concept of the ‘space-pixall’, reminiscent of the ‘space-particle’ of the Buddhist Kalachakra philosophy, in which there are five types of particles, related to earth, water, wind and fire and the aether/space as fifth. This last one is the smallest, ‘aetherial’, but most fundamental one. It is what remains when a world-system disintegrates: space-particles. The Buddhist analysis entails an emphasis on the ‘granularity of space’ as well as gives it a ‘body’ and even permanence. This characteristic makes it compatible with the concept of an ‘aether’, since this is understood the world over as ‘the stuff filling space’; the ‘body’ of space, the fabric, the energy of space. A space consisting of space-particles generates an other cosmology than the BigBang as we will see. (note the space particle in the following Buddhist quote, as the ‘fundamental con-substantial cause of the entire physical world’, so it is the first and most basic ontological unit). Note here the exceptional ‘permanence’ of the ‘space-particles’, where nearly everything is impermanent in Buddhism, but it brings these particles on a par with the Mind, which is of great importance as we shall see. The great lama actually sums up what has become a major challenge of this website: ‘All we need do is analyse and comprehend…. how the natural potential of… elements… could take shape from these space-particles’. Unwittingly I have for years worked according to the Dalai Lama’s ‘program’ in my efforts to give the space-particle (-pixall, -grain) the fundamental place (mathematics) and properties (resonance, field) it needs to fulfil its basic function. This is a ‘realisation’ I’d never expected when working on the ‘pixalls’ although the Dalai Lama’s talk of space-particles indeed originally had inspired me to go back to my erstwhile visions of ‘sparks filling space’ (Formentera ’72), subsequently triggered by the fundamental mathematics I found when in Ireland (Beara ’98/’99). The following is another gift, this time from Einstein, himself a bit of a mystic , where he describes exactly the characteristics of a ‘Deep-field’ by naming ‘singularities’, extremely dense point-forms of energy, as the fundamentals (in 1909, before GTR). He describes effectively an aether in my view ; the point here is the granularity, which disappeared in the General Theory of Relativity and with it the ‘basic field interferences’, the ‘oscillating field’. Put for ‘singularity’ the term ‘space-pixall’ and it says what I could not say better, the oscillating field is the ‘deep-field’, the aether. The pixall is the ‘valve’ of the zero-dimension, which ‘carries’ the pure light; maybe the pixall annihilates when sparking. These quotes of prominent proponents of mysticism and science illustrate perfectly where the two converge in the concept of discrete fundamental units and how the Big Bang-cosmology is made obsolete in one stroke (by the permanence of space-particles and by recurring cycles). If there were a beginning of time how could there be eternity? Eternity can only exist and be felt because there is no time, so how can there be a ‘beginning of time’, as cosmologists claim. Eternity is not material, it is space in its ‘suchness’. We see that Einstein intuitively describes an ‘aether’, a fundamental ‘field-filling’ of space – possibly the reason he abandoned the idea (because of his adagio: no aether)- his ‘singularity’ has a field, which, I say, it can only have because it spins in absorbing and emitting waves. In every point of space there is a spherical incoming wave-front as the sum of all the cosmic wave-field fronts. This front creates spin in every point and creates a reflex wave going outward, this creates a standing wave field (oscillating) and gives the centre stability and inertia. It is this interaction of the incoming and outgoing wave, the order of the standing wave which relates to the number 9, that our mathematical model describes or else, how a spherical wave transforms into an outgoing toroidal wave, that is what this website’s peculiar mathematics seems created for. At specific frequencies the pixalls lock into field-mode and get energized, this is the reality we see and the light it is made of. This spin is also seen as a vortex to negative infinity and, as such, a border-point of space opening to the zero-dimension, the pure light. Space only has an inner boundary, like there is no ‘other-side’ to the centre of the earth. When you can imagine that there opens a new dimension at the centre of the earth, which maybe we can visualize by taking the volume of the horn-torus as our curved space, and going through the centre point, aka borderpoint of space, we come into the space surrounding the torus surface, that is the zero-dimension of pure light (the 3D horn-torus is peculiar because its one centre point borders its whole surface and in 2-D its surface is a square). The horn-torus, 4. π².r² (indeed the square of the circle =(2. π. r)², with two equal radii), is the pivotal geometry of space on this website and shows consequently that its surface equals a square, but is bordered by one point only; this now is what ‘space-curvature’ can do in mathematics, I suppose, but here I miss all the tools to continue; for instance this may also be the ontological key to the holographic aspect of reality, the whole surface of the horn-torus is reflected in the central border-point, in every point of space. At least it is reported that the mysterious centre of the earth appears to have clockwise and anticlockwise motion, which is perfectly feasible in a horn-torus geometry and as such the doorway to the zero-dimension. No better geometrical way to see how all is one. The ‘pure light’ of the zero-dimension, although ‘outside’ of space, is in every pixall, so every pixall is a ‘carrier’ of light (‘lumini-ferous’ aether), which makes it literally true that everything is ‘made of light’ and this is why light does not travel and ‘speed of light’ is a misnomer. In this conception the ‘ray’ is a string of sparking stationary pixalls, which makes it appear discrete as a photon in observation, but the photon has no self-substance, it is just a rather randomly hit and sparking local pixall. The notorious double-slit experiment becomes trivial when you realize that the whole interference pattern of the ‘deep-field’ changes when you open or close a slit. The deep-field lines change, so do the the pixalls in their alignments along the field lines, there are myriads of wave-fields going through the slits, so that the pulse travels through a completely different local deep-field in either case. The whole ‘quantum enigma’ may disappear when you have an aether, a deep-field, and no ‘self-substance’; the ‘virtual particle’ is the ‘dormant pixall’, nothing virtual about it, except for its permanent inner metamorphosis. There is a deeper layer to reality than meets the eye and scientific lens, a layer that has to be inferred because by nature it cannot be ‘detected’, it moulds everything, it is the zero-dimension at the heart of every space-pixall. I do not think quantum-mechanics is as mysterious as it is made out to be, it is a matter of the right description, I predict, and of giving up long cherished and stern views about the ‘non-aether’ by embracing the aether again, however modified and ‘aetherial’. The notorious ‘wave-particle duality’ gets also dissolved in our description, because the wave is the form, the configuration, whereas the ‘particle’ is the observed momentary pixall-contents of the, always ‘passing’, configuration through the deep-field. The wave is the pulse, the form; the space-pixall is the medium, the substance. The ‘relativity’ here is that the deep-field is always at rest; no ‘energy- ‘forms’, though, are ever at rest, they are always changing, moving. From the point of view of the ‘form’, it is itself at rest and the deep-field flows through it, this is the ‘relativity’-aspect and caused by the substance of the form being fundamentally at rest; that is the paradox of the moving form (we feel at rest while constantly moving through the deep-field, our substance is always at rest, like being at rest in a seat in a moving vehicle). The form moves through the featureless fixed pixalls of the 4-D space screen, the deep-field, so the form (image) has no substance of itself, no ‘self-substance’, its ‘material’ content is the seemingly fleeting deep-field. Nor does the deep-field have form of itself, it is Substance as an aggregate of space-particles, formless, ‘unborn’. Only together form and deepfield create an ‘appearance of endurance’. So what we try doing in the following is finding a description of the ‘One-ness’ in personal experience and reality, an ‘enlightened ontology’; or how mind and space (-pixall) merge in the zero-dimension, how matter becomes mind, how duality disappears. That is the crux. To get to grips with ‘matter’ as manifestation of the mind, we have to carefully describe how it occurs in space. We have to become more aware of this deep relationship of space and matter, and of space and mind (where time falls away), because when you thoroughly catch that insight you must be halfway on the road to enlightenment, to ‘true liberation’. Experiencing the ‘ideality of reality’ is a key to understanding mysticism and concepts like Maya and Emptiness. 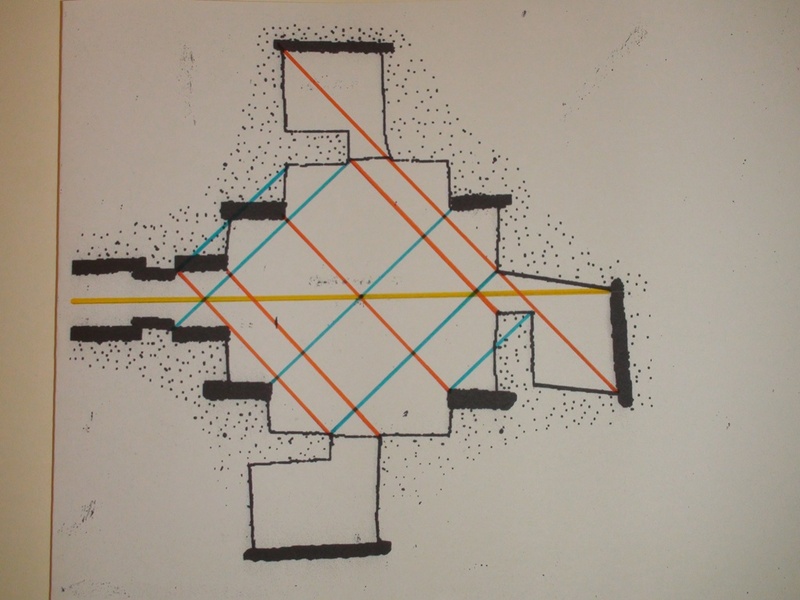 A way of understanding space as mind is seeing that space is no ‘volume’, and has no ‘abode’. A volume is finite and is in a place, but space nor mind have a boundary or location. Our concept of physical space is wrong, because we see it as a ‘vacuum’, ‘void’ containing ‘things’, whereas it is the ultimate ‘plenum’ and the ground of all existence as the manifestation of the One (Mind). What we know about atoms, the entities that give all the ‘qualities’ to ‘matter’, is that they form a neat mathematical system: the ‘Periodic Table’, one of the basic proofs of the mathematical basis of reality, and that more than 99% of the atom’s ‘body’ is space! It’s the physics-teacher’s golden moment when he baffles the class with this truth, matter is 99% space, wow! You would think this discovery was more important than Copernicus helio-centrism, but, no. This startling fact namely implies that we ourselves are 99% space. It was already a shock to find out we are some 70% water, but 99% space really beats it all. What ‘matter’ are we still talking about then, you wonder? We are the key to understanding matter, because we are matter ourselves, that is: 99% space. When all that bodily matter is (mostly) space it becomes easier to understand feelings and consciousness, it is just the state of space in the body. The brain is also 99% space, as if we didn’t know. Through the brain we are one with the deep-field and the zero-dimension of pure light. The most enlightened state of humankind is the bliss of the pure light (‘clear light’ Buddhists say), becoming one with the deep-field, Akasha. One of the central points in my approach to ‘cutting edge’ theoretical physics is the re-introduction of the concept of the aether. It is good to see that over the years more and more scientists come round to an aether concept again. Referred to is, for instance, the Hindu Akasha-field, the Chinese Tao/Dao. So we see also here a re-introduction of very ancient human knowledge, but knowledge based on enlightened insight. In many Eastern philosophies, as in ancient Greece, the popular 4 elements : earth, air, water, fire are invariably philosophically accompanied by a fifth: ‘aether’ or: ‘space’. In my system this ‘aether’ is usually called ‘deep-field’, as the actual ‘substance’ of reality, although, it must be said, this goes beyond the classical aether-concepts. Scientific concepts cut reality up in fragments, but this present ‘aether’ is integral with the One, an ‘experience’. Its concept is as in the East: a rather all-encompassing element, space , an aggregate of space-pixalls. This ‘aether/space-as-substance concept’ is an illuminating way of describing the inmost of ‘surface-reality’ (holography) and with it elements of the mystical reality, like Spinoza’s Substance. It is a way of describing the ‘emptiness’ of ‘particulars’, how it is all of ‘one taste’ as the Buddhists say. How it is at the same time ‘Nada Brahma’, as the Hindus assert, the primeval sound, the ground-vibration. (Sound can serve as a door to liberation and -sudden- enlightenment). How could ‘the Ultimate’ not be these things, these qualities, since these are words expressing the highest awareness and insights of quite diverse human cultures, levels of experience where science plays no part, where ‘enlightened intuition’ rules supreme. So our ‘scientific’ world-picture should contain these elements. Our immediate environment, that is the way we know the world. It seems a fragment but through Mind it represents the whole. Understanding the character of this experience of the ‘here and now’ as the whole is the doorway to liberation. We can begin to appreciate that our experience is the ‘world’ and that the seeming permanence and firmness of the world ‘out there’ delude us as regards its true character, it has no own substance, it’s mental, that’s why the Buddha called it ‘empty’, an illusion, a dream. In the Lankavatara Sutra the right understanding of reality is expressed as follows: ”When an objective world is no longer grasped, there is neither disappearance nor non-being, except something absolute known as Thatata-vastu, Suchness, the realm where the wise have their abode”. We see here the ‘Suchness’ of the world brought back to the subjective experience as deepest ground. Does our body represent a solid world? How does ‘solid’ feel like? In essence our body is only fleeting feelings, sensations, moods, images, nothing solid, it’s mainly space, as we saw. Herein lies the big mistake, the source of our ignorance, that we separate matter, our body, from our consciousness and from the rest of the world; a double existential mistake. Our body, as it is to us, is only in our consciousness and it is not separate, but the centre of our world. We tend to think of the body as a thing, but in last analysis it is the centre of ‘experience’. When unconscious, there is no world or body at all. Things only really start to ‘exist’ in our experience, when not perceived the world is in a limbo-state of ‘tasteless’ potentials, that only ‘materialize’ through consciousness into the forms we experience. Nous sommes le Monde, we are the world, we even ‘create’ it. Experience is our ‘being in the world’, one could say that the important Buddhist distinction of ‘sentient beings’, refers to beings that ‘experience’ a world due to their senses. So, again, the faculties of our mind create the world we experience and because this is so we can improve the world we experience by enhancing our faculties and intuitions. Animals differ from humans in this important respect that they cannot improve their collective and individual conditions, their mental capabilities are exhausted, their evolution of consciousness stopped, where they lack past and future in their consciousness (although they do remember by resonance), they cannot reflect and plan other than in an immediate situation or by collective instinct. We are definitely ‘more enlightened beings’ than animals are (although in many ways they far surpass us in sensitivity), because of our sense of eternity where past and future melt into the One, where the here and now gets expanded with past and future, in distinction to animals, it gives us in principle infinite possibilities: we are reflective and prescient (if only we were). It is in enhancing our individual and collective consciousness that our only hope for humankind can rest. The Juggernaut we are on collectively is heading for the abyss because there is still no really integrated collective control or any solidly agreed perspective for improvement, a lot of words so far. But the real cause is of course the ingrained competitiveness and self-centred-ness of the industrial age, the socially corrossive capitalist order and economy, there are no common perspectives, it is any for his own, a bonfire of greed, until its collapse. Another problem is that our collective crisis seems not very acute because it seems to hit the periphery, whales, polar bears, ozon-layers, rain-forests (rather ‘peripheral’ as vital climate and genetic storehouses), oceans in cms per century; it does not affect our daily lives, until recently. But in the mean time humankind has become a devastating plague to its own natural environment, by totally overstretched production and waste in every area (also finances), an ominous condition for the crash of a civilisation. In the ancient past they one of the incentives to stone-building was to build for many many generations, that should be again the perspective of collective endeaver.